The Titleist AP1 714 irons feature a cast stainless steel body construction with a concentrated tungsten sole weight, thin steel sole plate and an advanced dual cavity multi-material design. The AP1 714 is designed with tour proven technology, appeals to a wide range of golfers and is the most playable and forgiving iron that Titleist produces. The short irons have a traditional design with a progressively reduced blade length, camber sole with pre-worn leading edge for smooth turf release for improved feel and forgiveness. The low CG designed long irons generate an optimal high launch trajectory and provide increased stability and an excellent feel. Improved carry distance generated from higher launching, low CG long irons and compact, flatter launching short irons. Deep, undercut, dual cavity design with high density tungsten weighting produces increased forgiveness. Review by Rk, 1 year ago. Review by Keith, 2 years ago. do you have pictures of the actual set? Unfortunately, we do not have the ability to take actual pictures of the items available. We ship from multiple locations and could have more than one of the same exact set. Our Shipping Department will simply pick the item that is on top and ship that item. In the photos, you have pictures of 2 5 irons. they look totally different, which one is the set of, the newer version or the old? The pictures might make it seem like they are two different versions but it is the same set. 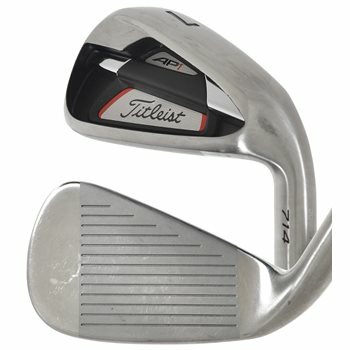 The Titleist AP1 714 iron set was released in 2013. The next version called the Titleist AP1 716 iron set was released in 2015. There is not an older or newer version of the AP1 714. A newer version is the AP1 716. How old are the clubs? Do you know what year they were originally sold? What is your returns policy? Can you bend these irons 3 degrees flat? How much would that be if you can? Unfortunately we do not have the ability to adjust the clubs before they are shipped. Any adjustments will need to be done locally. I am in Canada, I accessed your site through amazon.ca. Is the price I am seeing in Canadian Dollars? I would suggest contacting Amazon directly for clarification as we do not have control on how Amazon lists that information. We provide them with the price but I am not sure how they list it. Is the A wedge the 48 degree wedge?